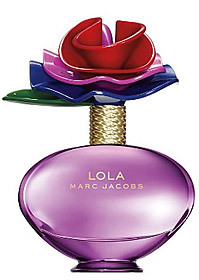 Marc Jacobs Lola was supposed to be a more grown-up Daisy. And I had seen this fragrance touted so much that I had to go and find some just to see if all the hype was true. I left underwhelmed with the scent but pleased with it all the same. In Bottle: Bright grapefruit, clean spice, and fruity pear. This smells juicy and clean right off the bat. It’s almost like a Herbal Essences shampoo. Applied: Fruity off the bat with a pile of flowers rolling in like a scrubbed clean tide of–uh–fresh flowers. I’m tired. Cut me some slack. That shampoo smell lingers for a bit in Lola as the opening stage gives way to the mid-stage where the flowers rise up a bit more and the fruity, juicy opening dies down to hold Lola at “Smells like shampoo”. This is a really nice, clean and feminine scent and I can definitely see where people would say this is a grown up Daisy. It doesn’t smell like Daisy but it does smell a little more mature. Not mature in the sense of a classic sophisticated perfume but if we were to assume Daisy is meant for the teen crowd, then Lola would be good for the college kids. She lacks the bright, grassy freshness and youth of Daisy but she makes up for it by being a clean pretty floral with a hovering sweet rose. Sweet rose being a good alternative to classic rose that tends to infuse a bit of youth into perfume’s most popular and, strangely enough, polarizing note. The dry down is a typical affair of sandalwood and vanilla with lingering traces of nice shampoo. Lola reminds me a bit of Gucci Flora with a less sweet mid-stage. Extra: Lola’s spawned a number of offshoot products. One of the ones I see most often is the solid perfume ring adorned with its iconic vinyl flower. Design: A big bright, red, purple, blue and green vinyl flower adorns the cap of Lola. The glass bottle itself is a purple color while the circumference of the cap is a textured gold-colored metal. There’s two bottle designs for Lola. The smaller (50ml) is a tall bottle. The 100ml is a squat, wide bottle. The design for Lola took a few pages from Daisy’s bottle design and it’s cute as a button. I didn’t think I would like the bottle design as much as I did but heck, it’s adorable. Not sophisticated at all, a little silly but not the least bit pretentious. Notes: Pink pepper, pear, red grapefruit, peony, rose, geranium, vanilla, creamy musk, tonka. If nothing else, Lola is an eye catcher for its bottle design. Subtle is not this lady’s business. The 100ml bottle in particular is huge and comes packaged in an equally huge box due to the giant vinyl flower cap. Reviewed in This Post: Lola, 2010, Eau de Parfum. This entry was posted in floral, marc jacobs, Reviews By House and tagged creamy musk, geranium, pear, peony, pink pepper, red grapefruit, rose, tonka, vanilla. Bookmark the permalink.